I had been looking for a birthday cake to make for my daughter from last few months. Since we celebrated her last year's birthday in India during our vacation, we've been thinking of celebrating it with her friends over here this time. 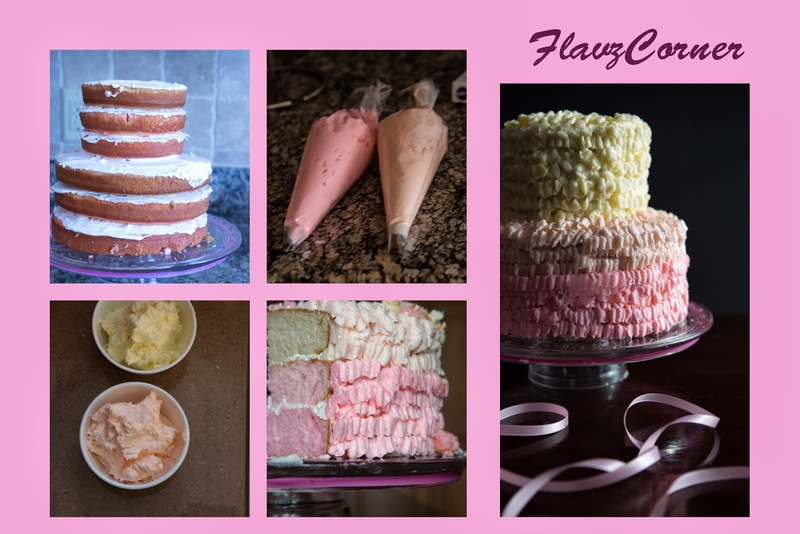 I had been on Pinterest looking for some girly cakes and wanted to try the Ombre cake just after when my daughter had a peek of the pink Ombre cake on pinterest while I was frantically looking for cakes on my phone. She was super excited and asked me if I could make one like that for her. I finalized the cake, flavors and the colors. Since we planned to invite friends and relatives it was a big group to entertain and I knew that it would be lot of work to prepare dinner and cake. I had a week of vacation and thought I would have ample time to do everything in the last 2 days, but me and my hubby got sick and was down for few days. So I relied on boxed cake mixes to make the cake base. I was determined to use the India Tree coloring I had with me for pink shades. We had the record low frigid temperature during last 2 weeks. So the weather was not helping us either to get better. On Friday afternoon, I started to bake the cake, I used the red color that I had and baked a pink shade of the cake. 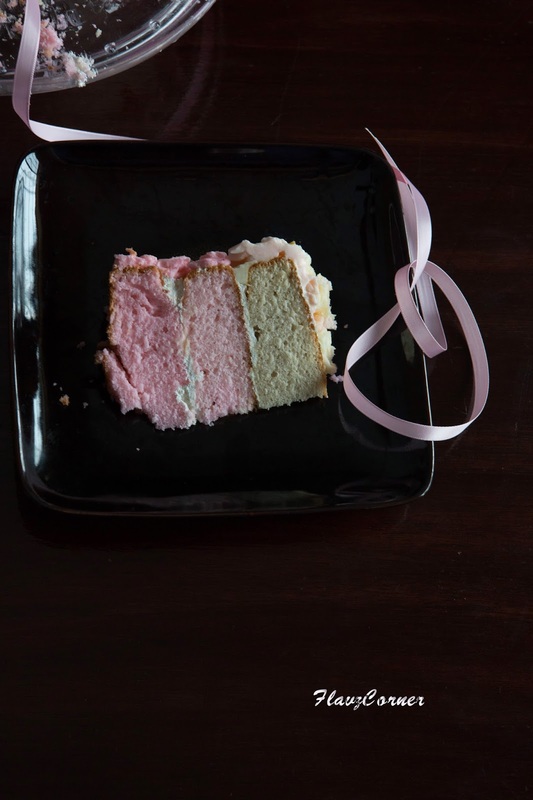 By the time I took the cake out, it was not either white or pink and had a weird color. I knew for sure that the India Tree color was not going to work for this cake. It was almost 4:30 pm. I was checking my blog and found few comments that needed approval and thought to send a facebook message to my friend Manju who blogs at Manju's Eating delights for her comment she posted on my blog. Since she was an expert on cake decoration, I shared my concerns and questions about the color of the cake I wanted to make, she directed me in the right direction. She advised me to use the gel color instead of the natural color. Even though I was reluctant to use artificial colors, I knew that I had to take that route if I want a pink Ombre cake that I promised to bake. Also its not everyday thing, you are just using it for one day. I made up my mind and thought to get it. My hubby was planning to go out for some shopping, so I thought I would ask him to pick up the gel color for me. He changed his mind after seeing the snow outside and was not really feeling good with his cold, so I just thought to step outside to get the stuff I need. I was literally in my home clothes, not well dressed for the bone chilling cold outside; put on my jacket and boots and thought to check out the grocery store that was 4 minutes away from my home. To my dismay, they didn't have the gel color; the store only carried some colored frosting. Then I thought to check out a bigger store that was 1/2 a mile away from this store. I was running through the parking lot to get to the store and get hold of the gel color. I was not able to find what I was looking for; with an upset mind I got into the car. I was not ready to give up and decided to check out Joann Fabrics which was almost 20 minutes away from my house. I gave a ring to my hubby and told him what happened. Since it was Friday, I wasn't sure if the store was closing early or not. It was already 5:30 pm and dark and the roads were not really cleaned. To add up to my frustration, a big truck got in front of me with huge wheels and it was going 20 mph on a 35 mph zone with splashing all the slushy snow on my windshield, besides it was a single lane for almost 15 minutes drive. I was like, I am not going to get there by 6:00 pm and store will be closed. I couldn't imagine of buying a birthday cake for her, since I had promised her to make the Ombre cake. Finally I was able to get in front of the truck and noticed that the driver was on the cell phone..... no wonder why the truck was going so slow....sigh....by this time I reached the parking lot of Joann Fabrics. I was flying through the parking lot and the temperature was just 6 °F, it couldn't have been any worse if the store was closed. But when I looked at the hours at the door, I was relieved to find that it was closing only at 9:00 pm. I went straight to the cake decorating section without sparing another minute and picked the pink color and got to the end of the line of 5 tor 6 people. I just took a glance at the color that I had in my hand while waiting...Oh no..I didn't pick the gel color.....ran back to the aisle and finally found the gel color and when I came back the line got little bigger. I was like what are these people doing at night in this store...are they all baking cakes clueless like me?... :)...The line didn't seem to be moving to me and there was only one register that was open. I wanted to bang my head, I was frustrated, tired and wanted to get home to bake all the 6 layers of cake that night. Finally another register opened and I got what I needed and got back home. My hubby was sweet enough to make a hot ginger Chai for me by the time I came home. I was explaining with great fervor the effort I put to get the gel color to my hubby and kids like Hercules task... phew. I was really glad that I decided to go to get the gel color, otherwise I am sure that my hubby would have gave up and came back home and made me go again. Later that night I baked all the six layers of the Ombre cake and I noticed that the pink shades were not really distinct because I didn't use the right amount of gel color. But the next day when I used them in the frosting during the day time they came out to be the colors that I was expecting. I was able to distinguish it better with the day light. The next day, Saturday, the day of the party, I started early around 8:30 am and finished the 6 tiered Ombre cake by 12:30 pm and I was really happy about how it turned out to be. My hubby was like 'Do you really had to put that much effort to make the ruffles, why didn't you try just plain leveled icing? '...I wanted it to be ruffled and I told him that I was exhausted and couldn't do anything anymore. Kids and hubby were happy to see the cake. It was hard to keep the cake covered because of its height. So I kept on the kitchen counter under the cupboard with 2 sheets of card boards on the sides to cover the exposed corners of the cake. The cake was 'moist and delicious', that was the verdict of my friends and hubby. We had some left over and kids devoured on them the next day. The cake was still moist and yummy the next day. Even though the cake didn't look perfect in my eyes, I thought the effort I put to decorate it was worth the excitement I noticed in my daughter's eyes and the enthusiasm she showed to break the surprise of the covered cake sitting on the kitchen counter that her Mom made for her with her friends. I was not able to take step by step pictures during the assembling of the cake. But I managed to click a few here and there. Make the batter of the cake as per the direction on the box. Add 1/4 tsp of coconut extract into the batter. Add the coloring gel one drop at a time and mix into the batter till your desired color is obtained. Divide the batter between a 8'' round pan and a 6'' pan and bake the cake till a toothpick comes out clean when tested in the center of the cake or till 20 - 25 minutes. Make 3 sets of cakes like this with 3 boxes of cake. One set should be white and the other 2 sets should be 2 different shades of pink. There will be three 8'' cakes and three 6'' cakes. In a mixing bowl of a stand mixer, add the cold whipping cream. Whip till soft peaks are formed. Now add 2-3 tbsp of confectioner's sugar and 1/4 tsp of coconut extract and whip for 30 seconds. Take a sauce pan half filled with water and place a steel bowl over it. Place 4 egg whites and 1 cup of sugar into the bowl and turn on the stove to medium flame. Using a long spoon, stir the egg sugar mixture continuously till you don't feel any sugar crystals when rubbing the mixture between your fingers. At this point you can notice that the egg sugar mixture is clear with light pale color. Turn off the flame. Now add the cold butter pieces one at a time and whip till the butter is mixed well with the egg white. This needs good 10 minutes of whipping. Whip till sharp peaks are formed. Add 1/2 tsp coconut extract to the frosting and whip it for 30 seconds. Add the gel color one drop at a time and whip till the desired color is attained. One set of the frosting should be white, the other 2 sets should be different shades of pink. I used 2 drops of pink gel to make the light shade of pink frosting. For the darker shade use 4 to six drops of gel color. I used Wilton tip# 104 to make the side ways ruffles. Transfer the 3 different frosting into the 3 different piping bags with the tip# 104. Using a serrated knife cut the bulged part of the cakes to level it. Apply 2 tbsp of whipped frosting on the cake board or the cake stand. Place the 8'' dark shaded pink cake on the cake stand. Gently press the cake onto the board with your hand to make sure it stays intact on the board. Now apply a dollop of frosting on top of the cake and spread it. 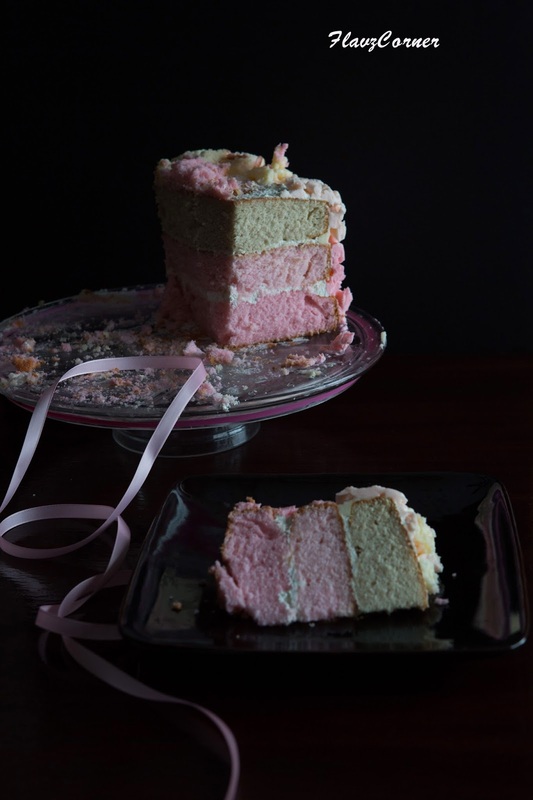 Place the lighter shade of pink cake on this cake. Apply another dollop of frosting and spread it. Now place the white cake above it. Apply the frosting and place the dark pink shade 6'' cake on top of the 8'' white cake. Repeat the steps of applying the whipped frosting and placing the 6'' cakes till all the three 6'' cakes are placed on top of each other. Apply the rest of the whipped frosting on the sides of the layered cake. Now start frosting the bottom layer of the cake with the dark pink shade of frosting. You can either use vertical ruffled pattern or go ruffles on the side ways like what I used. I used 3/4 of the frosting to decorate half of the 3 layered 8'' cake. Now use light pink shaded frosting to decorate the rest of the 8'' cake. The top three 6'' layered cake is decorated with white frosting. The top of the cake is decorated with white frosting using the same ruffled design by decorating in concentric circles. There was leftovers of the 2 shades of pink frosting which I saved to use on cupcakes. You can adjust the pink frosting by using 3 egg whites + 1 cup butter + 1/2 cup sugar to decorate the 8'' part of the cakes. The white frosting was good enough to decorate the top and sides of the three 6'' cakes. If you use another pattern or bigger piping tip, you might be able to use up all the frosting without any left overs. I left the cake outside for 2 days, since the temperature was cold and it stayed good without any taste difference. 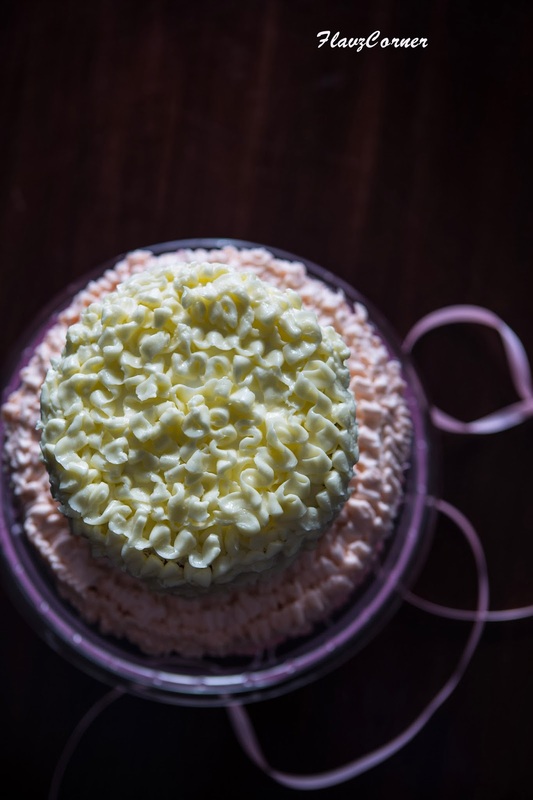 The Swiss Meringue Frosting is the perfect frosting to go for if you like a silky smooth less sweet frosting on your cakes and it can be easily piped. The consistency was perfect enough to make ruffles, swirls etc and it was stiff enough to hold the shapes. wow what a lovely luking cake.... drooling!!! Wow, what a project this turned into! The result is worth it, though - this is gorgeous! I've not heard of this cake before, but definitely need to try it (or rather, persuade Mrs K R to try it!). Good stuff - thanks.